What do you do with all that Homemade Ugly Lemon Curd you made yesterday? 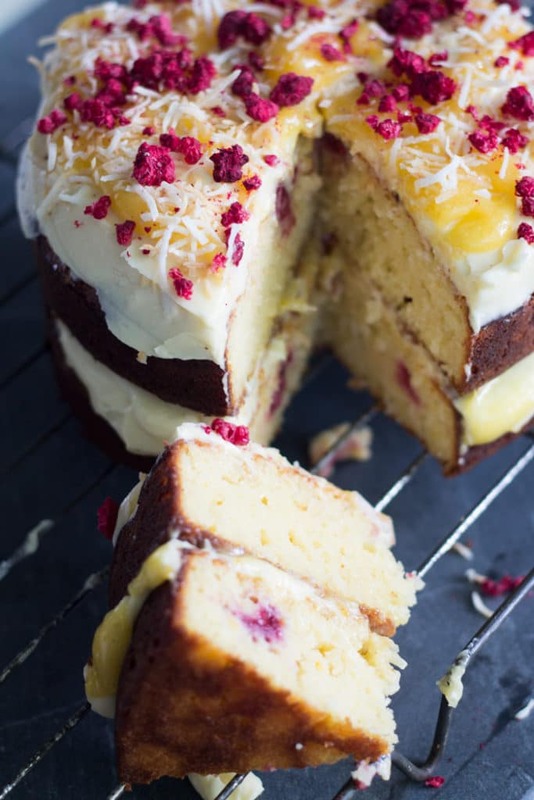 Make a Raspberry and Lemon Cake of course. 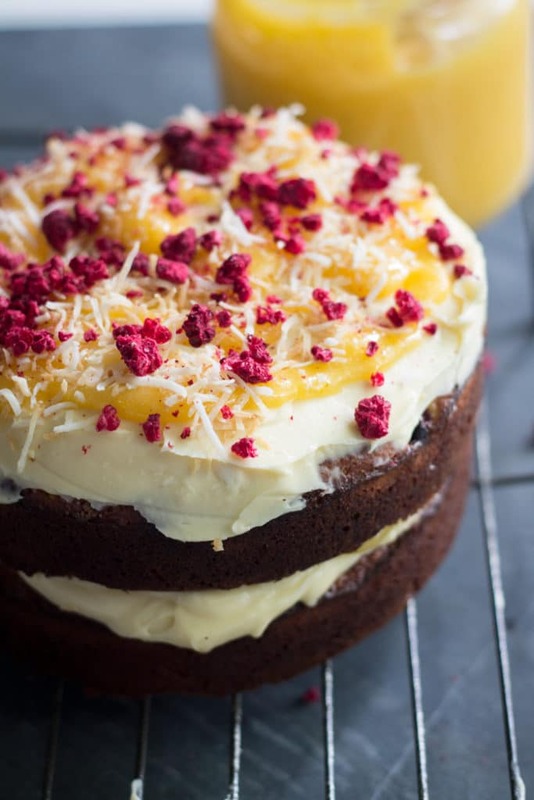 Layers of moist lemon, raspberry and almond cake studded with tangy raspberries, topped with creamy mascarpone, cream cheese and vanilla frosting and drizzled with your lemon curd. Enough said. You need to make this. It was my birthday a couple of weeks ago. If I had been more on to it you would have seen this or another celebration cake posted up that day on the blog…but I’m not. Actually my birthday wasn’t that much fun this year. My little boy Henry had surgery. It wasn’t anything major but the little guy had to have a full general and epidural-like pain relief which made me worry. I didn’t sleep at all the night before and was quite emotional when he went under the anaesthesia in my arms. We were so lucky though because the surgery and his recovery went better than I could ever have imagined thanks to the wonderful surgical team and hospital staff and he is definitely back to his usual super-charged self even copying his brother and woofing like a dog at me when he doesn’t get his own way. Oh to have boys! Needless to say by the end of the day I was just a walking zombie and completely emotionally exhausted but I was, and still am, full of gratitude. Gratitude for a healthy family and access to healthcare, something I often take for granted. My heart goes out to all those parents with children who are unwell and have to endure far more serious procedures than my little Henry, I am in awe of their strength and not only parents but anyone who has loved ones who have gone or are going through this. Also to those who don’t have access to the healthcare they need, I can’t imagine the frustration and unfair situation they are in. I went to a talk the other day by the very inspirational Dr Libby (I fully recommend any of her books by the way) and she said that you can’t feel unhappiness when you feel gratitude so here’s to being more appreciative of the amazing lives we live because even to just have our basic needs met, we really are lucky and I do need to remember that more often. If I could bake this cake for everyone out there who is in need of a treat or a piece of cake I would. This is just what I felt like on my birthday, I didn’t have time (or the energy) to make it but my gorgeous boys went down to the supermarket and bought me a big chocolate cake (chocolate because that’s George’s favourite of course). It actually tasted pretty darn good even with all the wax (and some spit) George blew all over the cake. 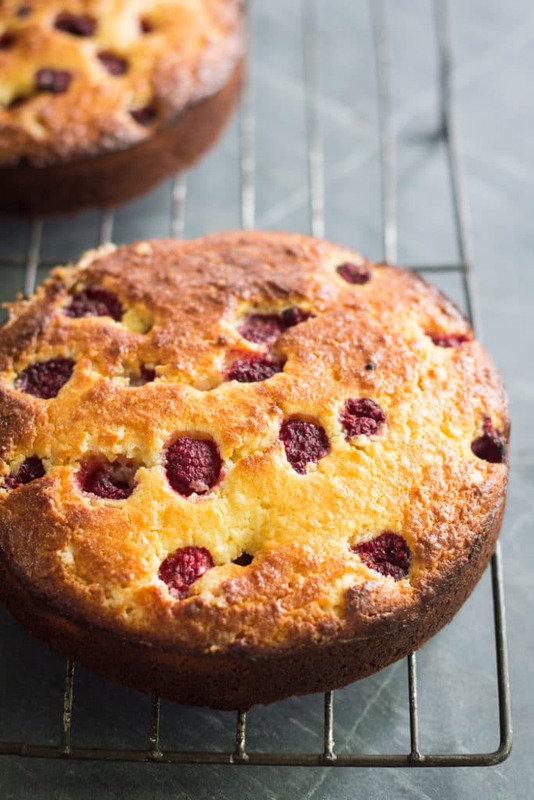 The next weekend I decided to make myself my birthday cake – my raspberry and lemon cake. It’s spring so it is perfectly light, subtly sweet and a little tangy – the perfect compliment to the season. It’s pretty easy to make and, get this, is completely free of refined sugar (yup, Dr Libby would be throwing me a high five right now) but you wouldn’t even know it. 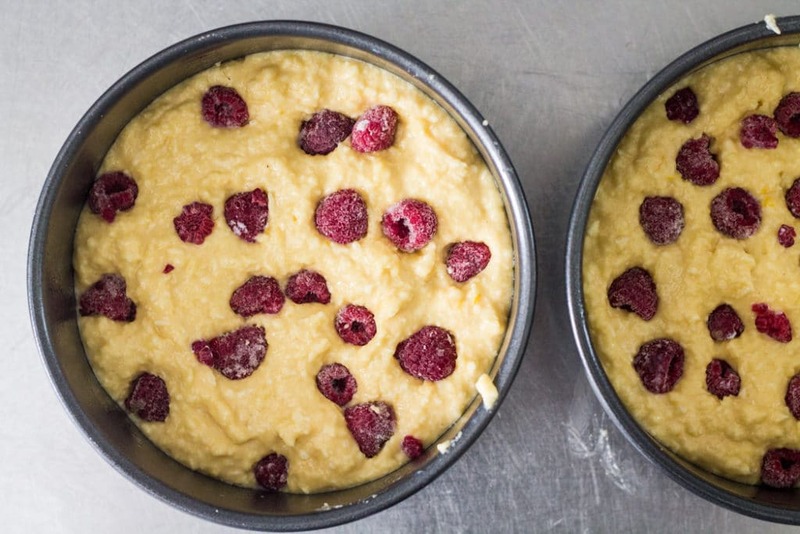 I’ve used frozen raspberries so that you can make it anytime of year and so that it’s not super expensive to make. It would also be really lovely with blueberries or halved strawberries, whatever takes your fancy. Now let’s talk about the frosting. I am going to say it. Yes. This is the best frosting I have ever made. Yes, it’s true. It even beats Swiss meringue buttercream. 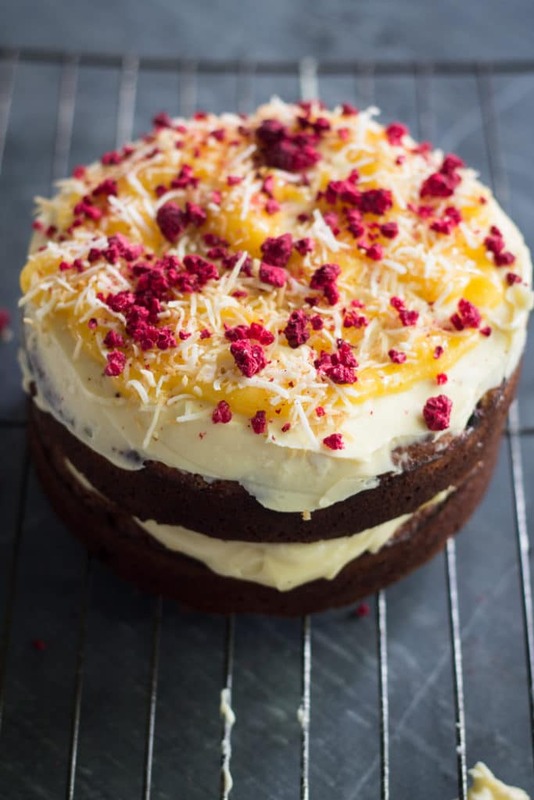 It’s also completely free of refined sugar with just cream cheese, mascarpone (mmmmmm! ), cream, maple syrup and vanilla bean paste. Those ingredients combined make for one killer frosting. If you don’t have 15cm/6in cake tins, or you can’t be bothered with the fuss of a layer cake then feel free to make the recipe using the quantities below and bake it in one 20cm/8in cake tin. It tastes just as good and looks almost as spectacular. So while I’m talking about being grateful I really need to thank you all. Thank you so much for reading my blog, for making my recipes, for sharing them on instagram (#mylittlelarder) and facebook and for supporting me. I am always so flattered and frankly surprised when people make my recipes and love them…so so grateful. Thank you wonderful people. If you’re ever in town, get in touch and I’ll make you some cake. 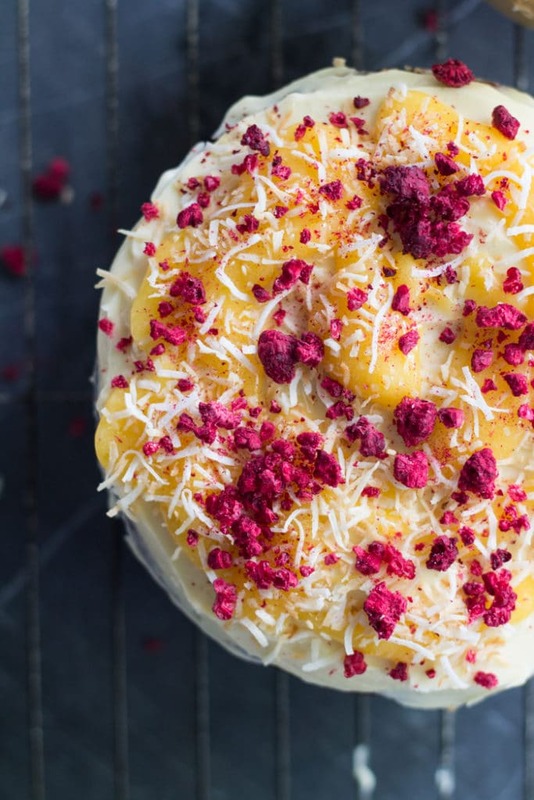 This cake is a delicious combination of lemons, almonds, raspberries and coconut topped with tangy cream cheese frosting, lemon curd and more toasted coconut. It's completely refined sugar free! Preheat oven to 180C/350F on fan bake. Grease and line 2 x 15cm/6in or 1 x 20cm/8in round cake tin(s). In a medium bowl, whisk together the flour, baking powder, ground almonds, desiccated coconut and sea salt. Set aside. In the bowl of an electric mixer (or in a large bowl if mixing by hand) cream butter and sugar until pale and creamy. Slowly add the eggs one at a time ensuring the egg is fully incorporated after each addition. If the mixture starts to look like its curdling then add a tablespoon of the dry flour mixture. Add half the flour mixture and mix to incorporate. 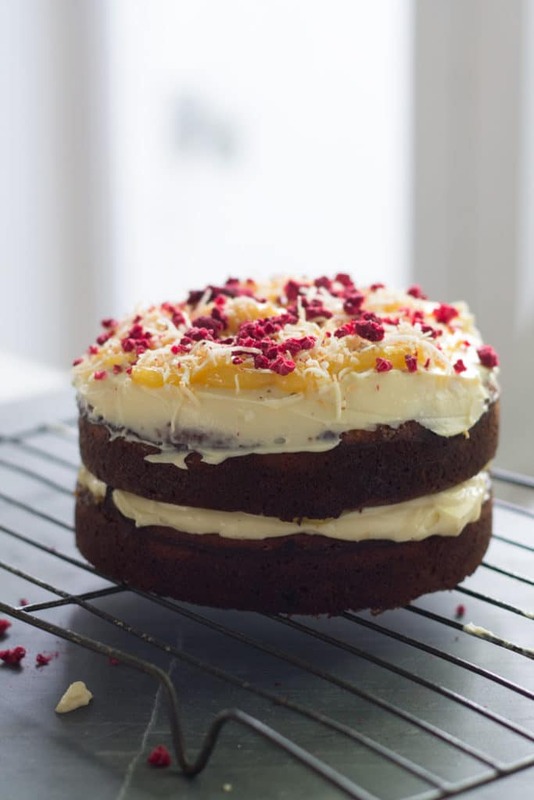 Add the vanilla bean paste, yoghurt and lemon juice and zest, mix to combine then add the remaining flour mixture and mix until just combined. Try not to over mix. Transfer to the tin(s). Scatter over the raspberries and gently push down using your finger. Bake for 20-25 minutes for 15cm/6in tins or 25-30 min for 20cm/8in tin or until a skewer comes out clean when inserted into the cake. Remove from the oven and allow to cool in the tin(s) for 10 min before turning out and allowing to cool completely on a wire rack. In the bowl of an electric mixer (or in a large bowl if mixing by hand) add the cream cheese and mascarpone. Mix at medium-high speed until smooth and combined. Add the maple syrup and vanilla bean paste and mix to combine. Turn the mixer down to low and gradually add the pouring cream. Once combined increase the speed and beat until you have a light and fluffy frosting, about 3-5min. Spread half the frosting over one of the cakes. 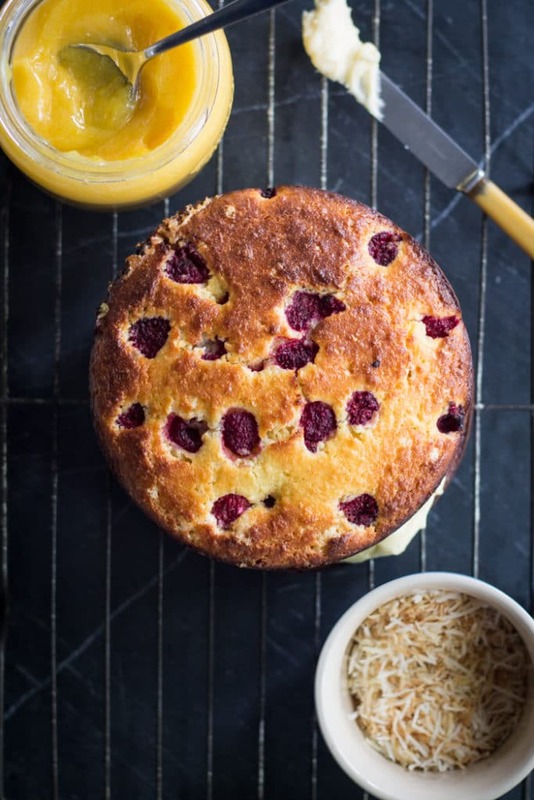 Drizzle over a little lemon curd and scatter with 1 Tbsp of coconut thread. Top with the second cake and spread over the remaining frosting. 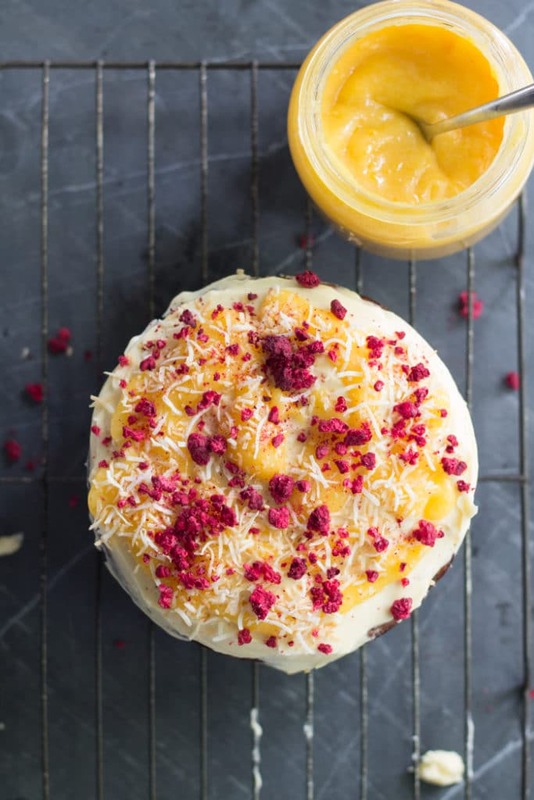 Drizzle over remaining lemon curd, sprinkle with remaining coconut thread and scatter over some pretty pink freeze dried raspberries. Best eaten on the day but you can store the unfrosted cakes in an airtight container for up to 2 days then frost on the day of serving. 1. Golden caster sugar can be found in the baking section of most supermarkets or online but if you can't find it feel free to substitute with refined white caster sugar. 2. Substitute with equal amounts of vanilla extract if you don't have vanilla bean paste. 3. To make toasted coconut thread place coconut thread in a dry frypan (skillet) over medium heat and cook, stirring regularly, for about 5 min or until it starts to brown. Watch it closely because once it starts to brown it can burn easily. 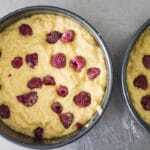 You can find golden (unrefined) caster sugar here and freeze dried raspberries here. If you make this, I would love to see! Tag your photo with #mylittlelarder on Facebook or Instagram or leave a comment and some stars below. Thank you so much Bethany! Yup, that’s definitely the theory I follow, 2…or maybe 3…okay 4 pieces.? Thanks so much Shelley and thanks for stopping by to comment! You are way way too kind! I’ll have to be more organised and cook for you next time instead of 5 Loaves take out!